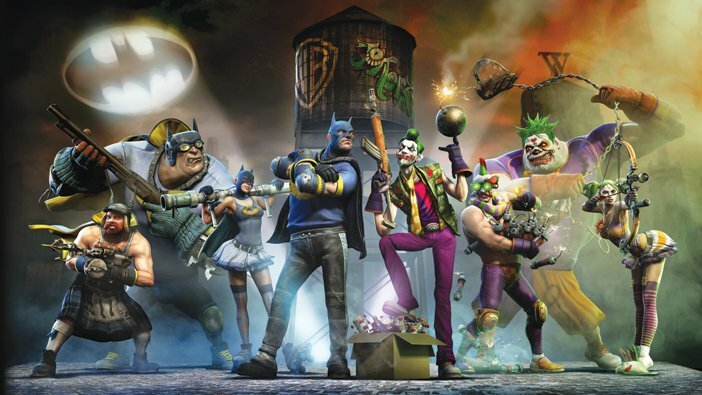 Warner Bros. Interactive Entertainment and DC Entertainment have announced that a free downloadable content pack for Gotham City Impostors is available now in the Xbox LIVE Marketplace for Xbox 360. The content will be available for PS3 and PC in the near future. · Matchmaking Fixes: Numerous additional fixes to matchmaking have been made, including join-in-progress functionality! · New Maps, Weapons, Gadgets and More: The 25th Floor map, the Kingmaker and Falcon Blade weapons, the Toxic Gas Support Item, and a new Fun Fact are all available right now! · New Costume Choices: Dress up your Impostor like a lunchador, a corporate schlub gone mad, and so much more!